In recent years, online privacy literacy has often been regarded as a potential solution to people’s seemingly paradoxical behaviors in online environments. Based on empirical findings that Internet users rarely implement privacy and data protection strategies,1 it has been suggested that they are simply not literate enough to make informed decisions in online environments. Throughout the last years, we2 have been working on reconceptualizing online privacy literacy and providing reliable and validated instruments to measure online privacy literacy objectively. In this post, I would like to summarize the different type of projects and publications that I was involved in over the last years. I also would like to describe how they led to my latest publication called “It is more than just privacy risk awareness: A reconceptualization of online privacy literacy as a composition of knowledge, abilities, and skills”. Online privacy literacy has often been regarded as a requirement for informational self-determination. Without the knowledge and skills necessary to navigate online environments and to ensure the protection of one’s personal information as well as to limit other’s access to the self, people cannot be autonomous in communicating and using online services. Hence, fostering online privacy literacy through education or other types of interventions has often been discussed as a potential solution to data protection issues on the Internet – both in political and scientific circles. Yet, it seemed that the the discussions remained superficial. Blinded by the potential of education to stopgap people’s seemingly paradoxical behavior, 3 people seemed all to ready to believe in an individual’s ability to learn the skills and knowledge to navigate the Internet safely and responsibly. But I think that also the research lacked behind. First studies in recent years only started to investigate people’s privacy literacy. Their initial findings suggest that the level of literacy was rather low4 and that people often overestimate their knowledge5 A more recent study which investigated three dimensions of online privacy literacy found that higher levels in all three dimensions predicted data protection.6 Although prior work on online privacy literacy existed, we realized that no comprehensive concept of, and no validated and reliable instrument to measure online privacy literacy existed. Prior concepts were often fragmented (focusing on one particular knowledge area, e.g., knowledge about data protection law or institutional practices of data collection and usage) or were focusing on particular platforms (e.g., Facebook). Additionally, such instruments were either self-reports or random, unvalidated knowledge items. In light of this, we set out to define this concept more comprehensively. So far, online privacy literacy had mostly been operationalized as a pure knowledge concept. A few studies had shown that such a privacy knowledge is related to more self-data-protection. In a first step, we conducted an exhaustive qualitative content analysis of prior literature on privacy literacy and a profound content analysis of different sources (privacy policies, juridical documents, EU deliverables…) capturing a variety of aspects relevant to online privacy. The aim was to capture any aspect or area that we deemed related to online privacy literacy. What knowledge should people have? Which skills should they possess? a combination of factual or declarative (“knowing that”) and procedural (“knowing how”) knowledge about online privacy. In terms of declarative knowledge, online privacy literacy refers to the users’ knowledge about technical aspects of online data protection and about laws and directives as well as institutional practices. In terms of procedural knowledge, online privacy literacy refers to the users’ ability to apply strategies for individual privacy regulation and data protection (p. 339). In a second step, our aim was to reduce the large item pool and develop a comprehensive, yet useable scale to measure online privacy literacy. Based on the initial item pool with 113 knowledge questions, we conducted three consecutive studies with which we tested the items for overall fit with the proposed theoretical concept. We measured all five dimensions identified in the qualitative content analysis. However, the analyses have revealed that the “legal” dimensions 3 and 4 were not distinct. The final scale hence includes only four dimensions of privacy literacy and consists of 20 items (five items per dimension). Figure 1. The estimated bifactor model (Masur, Teutsch & Trepte, 2017). Since its publication, the scale has been used in several studies – both nationally and internationally. Although higher literacy seemed promising in predicting people’s engagement in data and privacy protection, we started to question in how far fostering online privacy literacy was the right way to tackle the challenges of online privacy. In a chapter that was published as proceedings of the CPDP (a large conference on computers, privacy and data protrection), Tobias Matzner, Carsten Ochs, Thilo von Pape and I dove more deeply into the question of whether individual citizens should be responsible for their own data protection. Again, do-it-yourself (DIY) data protection has often been considered as an important part of comprehensive data protection. Fostering DIY privacy protection and providing the respective tools was seen both as important policy aim and as a developing market. Individuals are meant to be empowered in a world where an increasing amount of actors is interested in their data. The results of our scale development paper somewhat seemed to support this claim. In light of this, we started to question the role of online privacy literacy. By investigating the more recent literature on interventions and potential outcomes, we found that often enough, increasing people’s knowledge (even in all areas that were captured by OPLIS) did not necessarily result in a behavior change (e.g., less self-disclosure). It seemed even possible that people gained more knowledge through using certain privacy protection strategies and not vice-versa. It was hence unclear whether a respective intervention actually contributes to more self-determination on the Internet and whether it makes people behave more deliberate and more in accordance with their privacy needs. Through continued discussions and reviews of the literature, we came to the conclusions that online privacy literacy should be conceptualized as a combination of knowledge and specific abilities and skills. For this purpose, a reconceptualization is proposed that includes privacy-related reflection and critical abilities as well as practical privacy and data protection skills next to factorial knowledge about economic, technical, and legal aspects of online privacy. 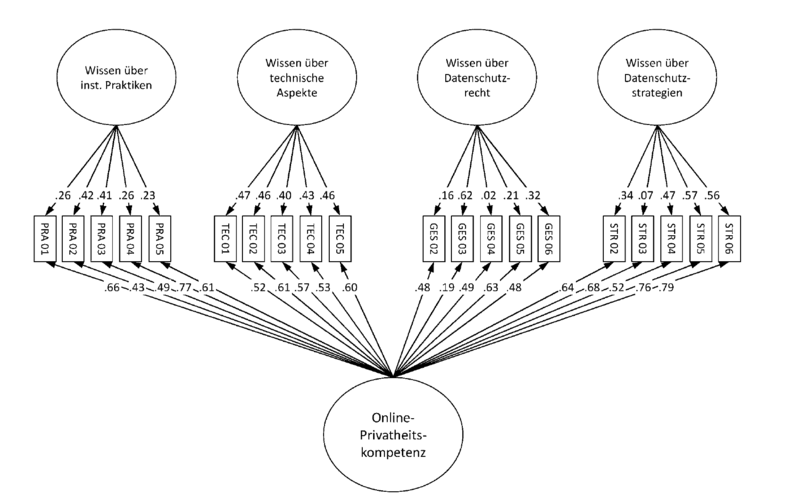 In my most recent publication, I developed this idea further and proposed a comprehensive model of online privacy literacy that outlines several factual privacy knowledge areas, privacy-related reflection abilities, privacy and data protection skills, and privacy-related critical thinking abilities (see Figure 2). Figure 2: A comprehensive framework of online privacy literacy (Figure taken and translated from Masur, 2018). With this model, I aim to provide a novel perspective on how to conceptualize privacy literacy. I agree that one of challenges today is that user are not literate enough to navigate online environments in a self-determined manner. But in contrast to prior literature, I do not think that is only a lack of knowledge that prevents them from becoming critical media users. Instead, I suggest that they (1) lack the knowledge to identify the risks involved in using online media, (2) do not have the necessary self-reflection abilities to questions and reflect their own behavior, (3) do not have the procedural skills to implemented increasingly more sophisticated privacy protection measures, and (4) lack the critical thinking ability to criticize the status quo and realize their own potential in actively changing their social and structural environments. Despite overlaps with some dimensions of media and digital literacy, I argue that the independent consideration of online privacy literacy makes sense both from a theoretical and an empirical point of view. Firstly, the focus on privacy-related knowledge dimensions, abilities and skills allows to explicit address necessary prerequisites for informationally self-determined behavior in online environments. Such a concept of literacy makes it possible to investigate particularly those person characteristics that actually allow the individual to determine for himself how his personal information and data is collected and used by potential third parties. Secondly, the concept allows for a conceptual condensation that is absolutely necessary for empirical assessments and imperative for potential educational programs designed to prevent irrational handling of one’s own privacy in online environments. Only the clear focus on privacy allows for reasonable operationalizations that are directly related to privacy-related behavior. With this in mind, I believe that investigating online privacy literacy as well as its antecedents and consequences is an important goal. At this moment, several international project use OPLIS to investigate online privacy literacy in different cultures and contexts. Given that privacy must often be understood form a situational 9 (or at least a contextual perspective10 such studies are of utmost importance to understand the circumstances under which Internet users make use of their knowledge and skills and under which they don’t. I will continue this research program in the next years aiming at understanding the connection between media and privacy literacy (is it a distinct concept or rather a subdimensions of a modern concept of media literacy?) and develop approaches toward assessing the various dimensions that I outlined in the latest paper. It is my hope that this research inspires other privacy scholars but also provides some valuable insights for practitioners and policy makers. The research program was started by Sabine Trepte, Doris Teutsch and me. Throughout the years, I further worked on this project with other scholars such as Tobias Matzner, Thilo von Pape, Carsten Ochs, Carolin Eicher, Mona Fischer, Alisa Hennhöfer, and Fabienne Lind who all contributed immensely to my current understanding of online privacy literacy. Since 2005, empirical work on people’s disclosure behavior in online environments (particularly social media such as Facebook) often found that people disclose a large amount of information despite strong privacy concerns. This observation has been termed the “privacy paradox”. Yet, more recent studies with larger samples and more sophisticated methods as well as meta-analyses have shown that concerns do relate to privacy behavior suggesting that people’s online behavior is not as paradoxical as it seems. Park, Y. J. (2013). Digital literacy and privacy behavior online. Communication Research, 40, 215–236. Nissenbaum, H. F. (2010). Privacy in context: Technology, policy, and the integrity of social life. Stanford: Stanford Law Books.